Rock in Iceland - Iceland Rocks! There are lots of interesting things happening on the rock scene in Reykjavík these days. The short-lived Ham might be ready for a revival, albeit as Rass, The group Sigur Rós is already internationally acclaimed, and there are others at least as interesting, emerging from the garages and sheds of Iceland. Mínus is hot stuff, and so is Benni Hemm Hemm and Ghostdigital. If you want some background information on rock in Reykjavík, there is a remarkable film that will do the trick. 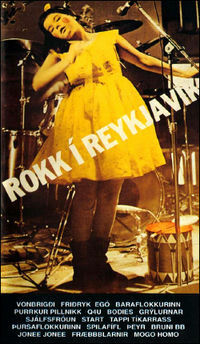 Rokk í Reykjavík, a feature-length documentary on the Icelandic rock scene in the early 80s. It was released in 1982 and has become a cult object. Director Friðrik Þór Friðriksson records an extraordinary era of Icelands rock history, punk rocks advent and the new wave explosion in a bustling city. The poster features a teenage girl in a yellow dress and boots. Her name is Björk, vocalist of the group Tappi tíkarrass. Björk went on to other groups, such as Kukl and the Sugarcubes, and has made a fine solo career. Another remarkable group featured in the film is Þeyr, a ground-breaking, short-lived rock adventure. Unforgettable. The film is also a unique documentary on several other memorable punk/rock bands. One of Icelands most consistently popular singers is Bubbi Morthens, who started out as a kind of Dylan-style working class hero and then moved on to unabashed rock. He also makes a memorable appearance in the film. One cannot mention Icelandic rock without paying a tribute to the magnificent Megas. He also started out as a Dylan-type intellectual protest singer, but his lyrics reach linguistic summits and his musical art is a world apart. Back to the present: it would be a good idea to make a rock documentary in Reykjavík these days. There are live performances and loads of energy all around. A challenge for music-lovers and film-makers.